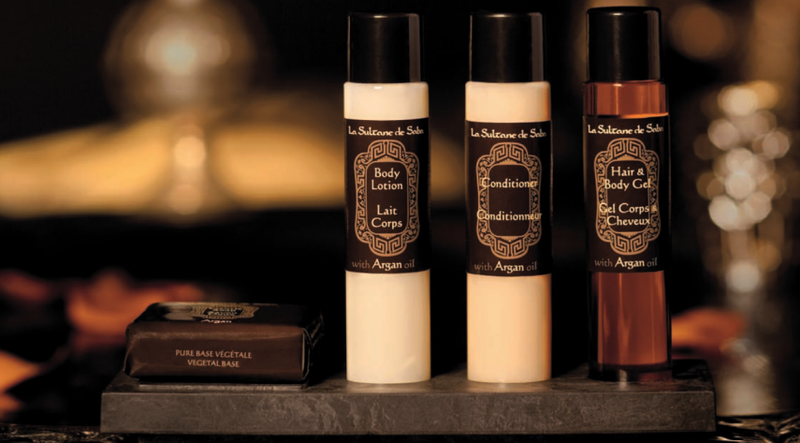 Paris, 15th December 2011 – Groupe GM, an international leader in hospitality products, is using the La Sultane de Saba spa brand to launch a line of hospitality products for hotel guests. Inspired by ancient oriental beauty rituals, this new range of products, perfumed with amber and enriched with argan oil, offers hotel guests around the world a journey of the senses. The La Sultane de Saba brand brings a touch of luxury and the exotic to the Groupe GM range, features that are both highly sought after by consumers. “This alliance with La Sultane de Saba means we can offer a unique line of hospitality products, enriched with oriental ingredients and scents. Faced with the ever-increasing demand for Spa products, we wanted to develop an authentic and sensual line offering a veritable journey of the senses”, commented Laurent Marchand, Groupe GM Chairman. In creating the La Sultane de Saba brand, Vanessa Sitbon has made available all the secrets of oriental beauty recipes traditionally handed down from mother to daughter. The aim of the brand, with its thousands of colours and scents, is to offer its customers a unique exploration of the senses in a distant universe where dreams are paramount. Respecting an extremely strict charter, the La Sultane de Saba hospitality products are paraben-free, not tested on animals and have no animal based raw materials. Argan oil, contained in all the brand’s products, comes from the nut of the argan tree, a Moroccan bush. It is well known for its nutritional and cosmetic values and its many medicinal properties. It is suitable for all skin types. “As the journey was my source of inspiration and the very essence of my products, it made perfect sense to find them in hotels, places of escape and dreams devoted to individual pleasure. Our new line of products is in keeping with the idea of the journey, because as well as discovering a country, hotel guests will be able to enter a sensory world of unique well-being and relaxation where enjoyment will be present from the first moment. With its international network and experience, Groupe GM was the ideal partner for achieving my goal and strengthening the luxury image of La Sultane de Saba”, said Vanessa Sitbon, the La Sultane de Saba general and artistic director. To complete the cosmetic range and reinforce the oriental universe of the La Sultane de Saba range, Groupe GM has also developed a line of accessories to complement the cosmetics, presented in non-woven sachets and decorated with the brand’s emblematic logo. It includes a manicure set, sewing kit, shower cap, cotton-buds, pumice stone, comb, shoe mitt, tooth-cleaning set and shaving kit, and every accessory can be ordered individually. •	Formulations enriched with amber perfumed argan oil, paraben-free and containing no animal raw materials. •	Line composed of 30 ml bottles of shower gel, shampoo, hair and body gel, conditionner and body lotion, and a 30g bar of gentle soap. •	Also includes a tray made from biodegradable material and a Hammam box with an exfoliating mitt and a 30g bar of exfoliating soap. La Sultane de Saba is a French Spa brand created in 1999. With over 1200 points of sale around the world, including a number of La Sultane de Saba Spas, the brand is sold not only in France but also in Switzerland, Benelux, Spain, Portugal, Italy, UK, Russia, Ukraine, Poland, Czech Republic, Japan, Qatar, New-Caledonia, Reunion, Tahiti and Saint-Martin. La Sultane de Saba has received two quality and innovation awards for its products. In 2006, it received the H. Pierantoni innovation award for the L’Essentiel range, and in 2007, the CosmeticMag Oscar in the Beauty Parlour Body Care category for the Journey Balinais range.